Lucy Newell, Kati Hulme and Bradley Davies Pughe took the major track and field honors at Shrewsbury Athletic Club’s annual awards evening, hosted at Salop Leisure. Lucy, who broke the club record for 1,500m for under 13 girls, received The Eileen Sandford Trophy from club chairman Ian Allport for the best performance on the Shrewsbury track. 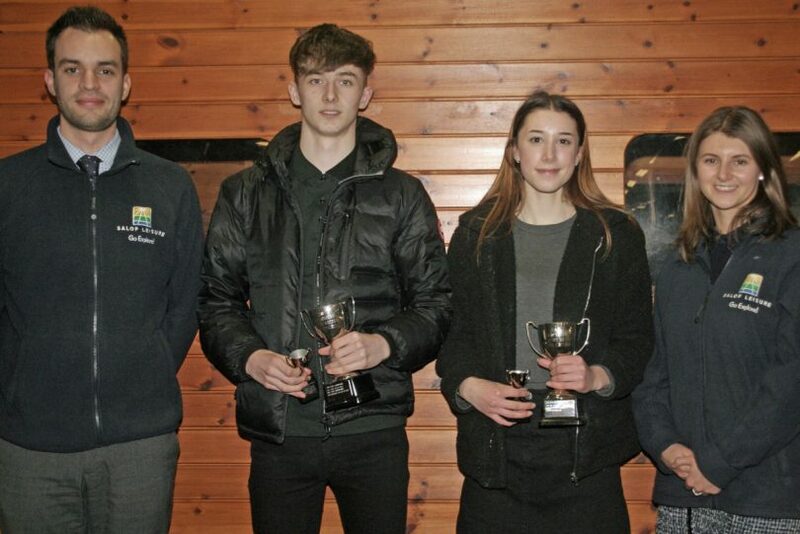 The Salop Leisure trophies were presented by Ed Glover and Laura Wilde, from Salop Leisure’s marketing team, presented the Salop Leisure trophies to the highest ranked athletes on the UKA Power of 10. Winners were Kati for the 300m hurdles and Bradley for triple jump. Kati also set a new club record and Bradley is now third on the all-time club rankings. Awards were presented by club officials for cross country, Sportshall, fell and road running and track and field. The evening was well supported by athletes, parents and friends. Cross country winners. Junior: Lindsey Newell, Beth Trow, Lillie Dean, Adam Bentham, Finlay Walker, Jack Kinrade, Iris Downes, Georgina Trow, Amelie Owen, Jack Margerison, Alfie Dean, Adam Edwards, Jess Gunner, Emily Pyle and Lydia Carter. Senior/Masters: Matt Hall, Sara Willhoit, Paul Jones and Gill Evans. Sportshall: Jasmine Barrett, Rachel Yewbrey, Chloe Speake, Maddie Aiston, Maddie Parsons, Isabelle Jagielka and Sophie Vernon. Fell winners: Bethany Pinches, Connor Middleton, Scott Hall, Gill Evans, Andrew Birch, Kevin Francis, Haydn Jones and Gordon Trevor. Road running: Paul Jones, Kevin Francis, Richard McKenna, Matt Hall, Sara Willhoit, Lauren Morley and Jenna Middleton. Track and Field award winners: Best performance: U/11: Bridget Williams, Evie Jagielka, Raphael Carsen & Jamie Speake. U/13: Lucy Newell, Maddie Aiston, Maddie Parsons, Adam Edwards and Jack Kinrade. Most improved: U/15: Stephanie Walker, Iris Downes, Chloe Speake, Laura Hulme, Dion Thomas and Luca Raisin. U/20: Sophie Vernon, Dora Tomlinson, Kati Hulme, Rebecca Walker, Louis Schofield, Brad Davies Pughe, Max Millerchip, Ed Barnes and Joe Gilling. Individual discipline trophies. Junior: Throws Sophie Vernon and Ed Barnes. Multi events: Sophie Vernon and Ed Barnes. Hurdles: Kati Hulme and Joshua Inpog-Pirard. Sprints: Natasha Pryce, Isabelle Jagielka and Max Millerchip. Jumps: Rebecca Walker, Dora Tomlinson, Louis Schofield and Brad Davies-Pughe. Middle distance: Jess Gunner and Joe Gilling. Senior. Middle distance: Emily Newcombe and Gabe Morris. Jumps: Patrick McBride. Throws: Pat Higgins and James Hickinbottom. UKA 100 Target: Chloe Speake, Stephanie Walker, Jack Chatha, Rebecca Walker, Kati Hulme, Dora Tomlinson, Sophie Vernon, Louis Schofield, Brad Davies Pughe and Bethan Evans. Outstanding awards: Matt Hall for cross country and middle distance. Performance in Inter club competition: Kati Hulme, Brad Davies Pughe, Jack Kinrade and Chloe Speake. Commitment awards: Rebecca Walker, Reuben Green, James Hickinbottom, Olivia Clarke, Steve Waters and Emily McBride. British champion award: Andy Lewis and Pat Higgins. Representative awards. English Schools Track and Field: Kati Hulme, Dora Tomlinson and Rebecca Walker. Welsh Schools Track and Field: Natasha Pryce. English Schools cross country: Iris Downes, Jess Gunner and Lydia Carter. Midland and GB Masters representative: Pat Higgins. Junior award for athletes in their final year as a U/17: Kati Hulme, Dora Tomlinson and Max Millerchip. Shrewsbury-based marketing agency, Codebreak, is sponsoring the 30-Love tennis lounge at The Shrewsbury Club. Shropshire building contractor Pave Aways has solidified its position as a leader in the education construction sector with a string of contracts worth more than £6.6m. A free HR workshop being staged in Telford is promising to help small companies manage their staff more effectively – and stay the right side of the law.